forum.419eater.com :: View topic - Join the Illuminati! I've been contacted by quite an elaborate scammer. It starts on Instagram and moves to whatsapp. 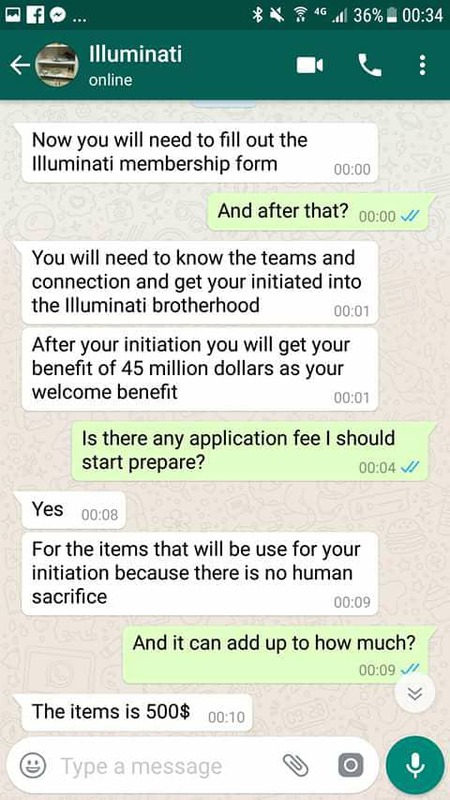 This guy wants you to do many things before asking you to pay him money for items needed to join the illuminati. I've been messing with this using many fake numbers over the past week. I found this forum and thought it would be a great place to let others do it too. I'm looking forward to see what everyone will do with this. Based on the little information given in your post I would suggest that you are in contravention of that rule and, as such, will be editing the personal information shown. If you can evidence your assertions I will be pleased to reinstate those details. How does that image prove that the telephone numbers and Instagram username you posted are involved in the scam? All I see is a WhatsApp chat with "Illuminati", no indication of phone numbers. Then claim it came from HughJass618's phone number or email address. And that's pretty shady. Apologies, I've just joined this forum and I am not familiar with it. Here is the proof of the scammer. There are 2 instagrams involved. I was able to find proof of the first one which is @nelsonscottilluminati. You will see in his dm the whatsapp number he gave me and then a screenshot of his contact info along with some chatting I had with him. I hope this is better proof. I was unable to recover the 2nd instagram account because I was blocked on it. HJ, I had to delete this link, too, since the first image provides a phone number and no evidence. Let's start all over. You have a PM I sent to you on March 3, when you joined. See up in the top where it says "Messages (new)?" Click that. Among the items listed in there are some general do's and don'ts. There is also a link to our Guidelines. You will also find them at the top of each page. You only need to click the word "Guidelines." Or, if it's any easier, you may click this: Guidelines.